It seems impossible that our stay in the Loire Valley is nearly over. I'm sitting in the lovely enclosed garden of our gite ( the wifi can't make it through the thick walls, so I need to use it outside), beforewe set off on our last little local expedition to the baker, the butcher and he cafe. We can walk there along the Loire, and we have, but it takes 45 minutes each way so today we're driving. Here's the river at the end of our lane. Cour sur Loire is, according to the Unesco sign on the riverbank, the exact centre of the Loire Valley world heritage site - a nice thing to know. We've been to five chateaux, including the one in Blois, and one tiny one, Troussay, the smallest of them all. In Blois (heavily bombed in 1940) we saw a striking war memorial - it included not only soldiers (militants)' but also civilians, resistants, and deportees, and noted that the government of the day had been complicit in what took place. 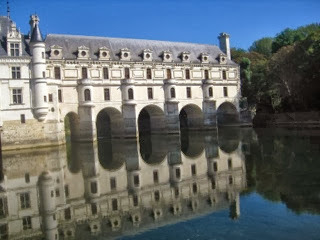 Chenonceau, the graceful "Ladies' Chateau", sat on the Cher river on the border of occupied France, and the owners smuggled people out through its passageways. There are sometimes odd lacunae in the official leaflets. 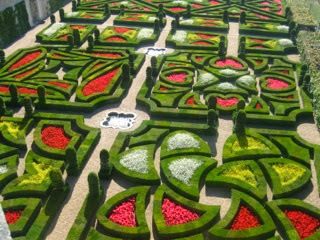 Our last and most distant chateau, Villandry, was said to have been completely restored - including the fabulous gardens - by a Spanish scientist. But not until we got inside did we discover that all the money and half the enthusiasm came from his American wife, Ann Coleman, also a scientist and the heir to an industrial fortune, who defiantly married him when the US was at war with Spain. Here's part of heir legacy, I'm so pleased to have seen it. 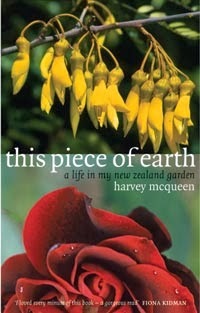 These are the gardens of love - romantic, affectionate, flirtatious and tragic ( the dagger shapes). They were restored according to ancient accounts of hem and the archaeological traces they had left in the earth. And of course Harvey would have been fascinated by them. So, off soon to new adventures ( this time by myself) in Tours and Lyon. Mostly when I speak French, people respond with perfect equanimity, so I expect I will manage without too many dramas. What fascinating places. 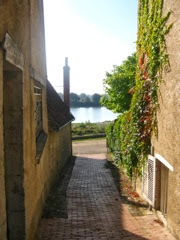 I never did get to the Loire Valley when I lived in France, so am enjoying seeing your photos and reading your account. Delighted to be your armchair travel guide, Juliet.